The beauty of reminiscing. It's the mid 1990s. Purple anodising is in. Alongside way bigger chainrings, way smaller cassettes, way narrower handlebars and bull horn bar ends. Not to mention the bedazzling colours adorning lycra everywhere. Back then, my fully rigid bike weighed more than my full suspension rig does now and I'm proud to say I cut my bars down extra narrow to go even faster and raced in purple, yellow and red lycra. Oh yes. It was a beautiful thing. Mount Climie was home to some classic kiwi mid 1990s mountain biking. And 21 years since the last race was held, we figured it was time to go back. Plus, that piece of gravel track holds a special place in my heart. Many a happy (and even the odd unhappy-please-when-will-this-end) hill rep has been had on that track in the last couple of years. And there's a beautiful view from the summit (on a clear day). 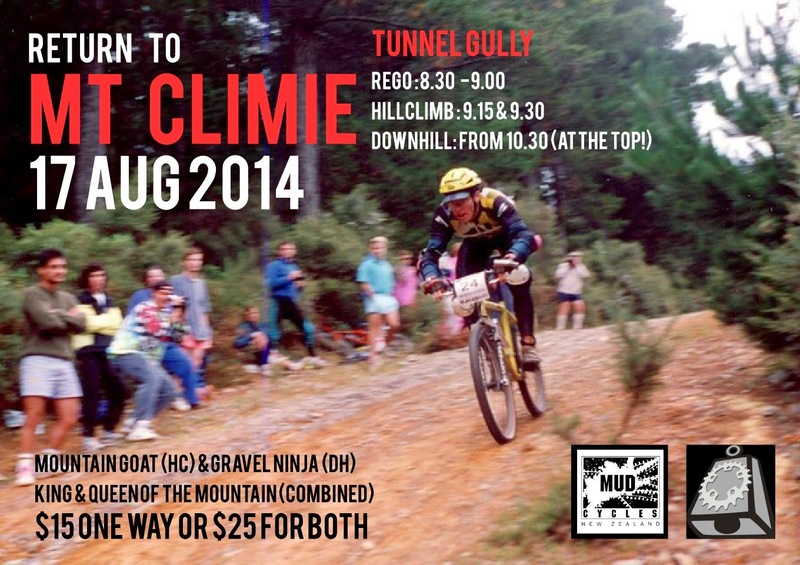 On 17th August, we'll be holding Return to Mt Climie. It's a "back to the nineties" type of race and fundraiser to help us get our wrench monkey to World 24 Hour Solo Championships. You've gotta get yourself and your fine steed from the gate (at the upper car park of Tunnel Gully) to the trig. Pedalling is recommended. Pushing is a valid alternative (especially on the steep bits). It's a 4.4 kilometre almost relentless grind up 610m of altitude gain with an average gradient of 14% and some pitches up to 20%. Mr Dave Sharpe's PB up there is 29:41. My best effort is 33:40. I guarantee it will keep you honest (trust me, I'm a doctor). If the uphilly stuff is not so much your thing then sign up for some old school drifty gravel corner downhill action. Or, even better, do both! Winners (9:15am) - everyone else! Downhill will be started individually with 30 second intervals from 10:30am onwards. We will NOT be able to transport you to the summit. If you are a grand mountain ninja who does not like going uphill so much, you are more than welcome to set off early for the long walk and heckle the mountain goats as they go by. We will have super rad photography by Running Quail Productions (check out more of Ricoh's fantastic shots here), cool prizes, a raffle, some homebaking as well as smiles, banter and COWBELLS!!! And a handy vehicle to transport warm kit to the top or the bottom for you while you race. And maybe a beautiful view at the summit.